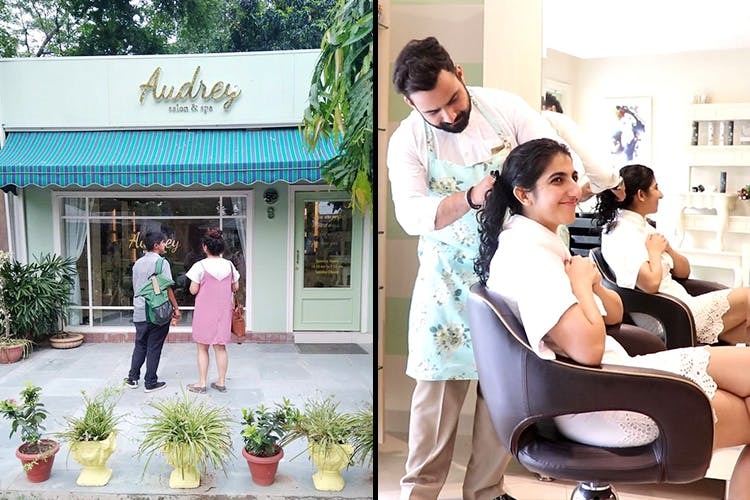 Audrey, an adorable little spa-slash-salon in Santushti Shopping Complex, is a great place to stop by for some mid-shopping pampering—think facials, hair spas, massages and the like. The fact that it's not got a clinical salon vibe, and that their staff is friendly and very smile-y. It's a pretty place to get yourself pampered at, looking out at the sunny greenery of Santushti. Also, the pastel colours and decor have a very calming vibe while you're getting that manicure or haircut.Between three team members, we tried out the facials and the hair spa. While the facial left a bit to be desired, the hair spa was both nice and unobtrusively done (it'll set you back by about INR 1,500 a pop, plus taxes). It also yielded pretty decent results—my hair was, indeed, a lot less dry. They use luxury hair products (Balmain and Olaplex).What was really nice was how sweetly the staff treated a lovely old lady who came in for a manicure. Not only were they patient without being patronising, the heard her out about what she wanted, and gently gave her the minutely updates she kept asking for about how the manicure was going. By the end, she had a nice-looking manicure and seemed happy overall. Left a good taste for the average observer. The facials. Our team members who got them found them a touch lacklustre. For people with little time to spare, they have shorter versions of their hair spas, massages and facials—all you have to do is ask.